Dominated by snow-capped peaks and surrounded by crystal-clear waters, Lyngen is a breathtaking destination to experience summit-to-sea ski touring. Rising straight from the Arctic sea, the mountains of Lyngen present some of the most scenic ski touring opportunities in Norway. From steep couloirs to less challenging inclines, the varied terrain of Lyngen offers exciting potential for every ski touring enthusiast. Its location at 70 degrees north exposes this Alpine peninsula to immaculate snow conditions and one of the longest ski seasons, helping to enhance Lyngen’s reputation as one of Norway’s best ski touring destinations. The full potential of this land is realized in spring, with crisp Nordic sunlight that offers warmth for the climb and gently melts the snow’s surface to create perfect grain snow conditions for the descent. In addition to all this, if you visit early in the ski season you have a chance to combine your ski tour with the ethereal beauty of the northern lights. From Lyngen, you can also do ski touring detours to the Tamok Valley, a terrain with fantastic inland skiing possibilities dominated by rounded peaks, long couloirs and big open faces. The cold inland climate guarantees a longer skiing season and increased chances of powder snow. Another option in Lyngen is sail to ski. Using a traditional sailboat or former fishing trawler as your comfortable base, local mountain guides will locate the best possible conditions for a skiing expedition. Well connected by road, Lyngen is only a two-hour drive from the town of Tromsø. Choose from a full range of accommodation options – from full-service, high quality hotels to authentic Norwegian cabins. Last but not least: Stay safe and find out about the avalanche risk before you set out. You can check the avalanche forecast for Lyngen at varsom.no. 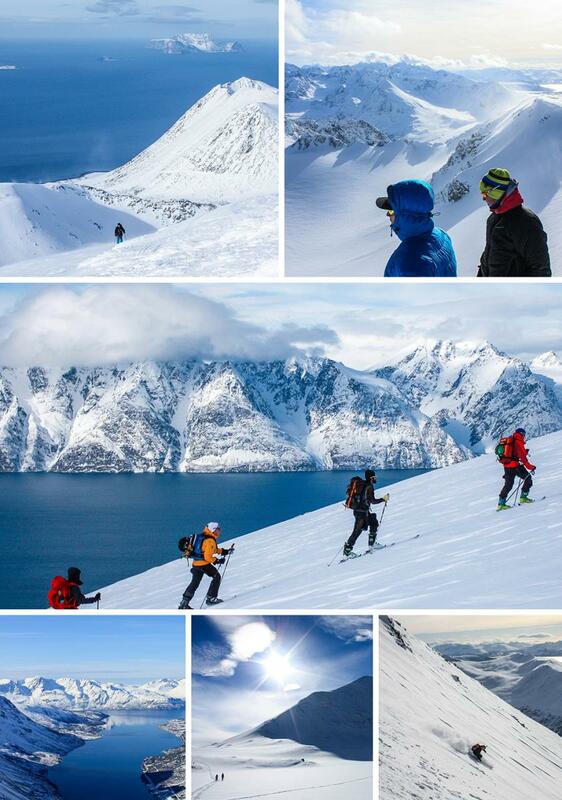 Read more about ski touring in the Lyngen area. Tafeltinden (1,395 metres) makes an impressive tour in the heart of the Lyngen Alps, reachable by an easy climb via the Koppang glacier. Access from the parking at Koppangen, some 15 kilometres from Lyngseidet. There are a number of restaurants in Lyngseidet (for example K-Punktet kafe), Olderdalen, Storslett and Sørkjosen and Skjervøy. Bars in Svensby, Lyngseidet, Djupvik, Skjervøy, Storslett and Skibotn are open all year around. From March to April there are also a few après-ski offers in the region. See all your options for eating and drinking in the Lyngen area here. The Center for Northern People is open all year round, but most of the other museums in the area are only open during the summer season (June - August). See all cultural attractions in Lyngen here. From December to March there are many fun winter activities to try, for example ice climbing and snow sledging. Naturally, you will also be able to witness the magnificent northern lights in the winter season. See a complete list of things to do in Lyngen here. Ski touring in the Lyngen Alps. Kjelvågtinden on Uløya with a view to the Lyngen Alps. Tromsø is an excellent base for ski touring in Lyngen. 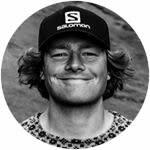 Joakim Dokka is a ski tourer who knows the area well. "If you seek high peaks, spectacular views, steep skiing and a ‘ski to the sea’ experience, the Lyngen peninsula in the northern part of Norway is where you want to plan your next ski touring trip", he says. He recommends going to the heart of the peninsula and visit the tallest mountain Jiehkkevárri (at 1,834 metres above sea level): "The roads are mainly near the coastline, so you have to expect a longer touring trip – but with this scenery that will just be a bonus." "You can also find and explore steep couloirs and faces in Lyngen", Joakim continues. "Keep in mind that it gets quite dark early during the winter season, but the glaciers and couloirs provide good conditions as late as the end of May and in June." "Many of the peaks are highly accessible, and there are even many skiable peaks right beside the road." Explore the unmistakable landscape of Lyngen as captured by local ski touring enthusiast Joakim. Get in-depth travel information for Lyngen at Lyngenfjord’s official website. There are plenty of Ski & sail tour operators in the area. Nearly all boats depart from Tromsø in the morning and return in the afternoon. There are daily ferries between Tromsø and Lyngen, but the options may be limited in the evenings and during the weekends. Rent a car at the airport or in Tromsø city centre. Many accommodation providers also offer transfers to and from the airport. The nearest airport is Tromsø Airport (TOS). There are several daily flights to and from Oslo, and a number of direct international routes. From the airport, it is a 1,5 - 2,5 hour drive to the main skiing locations.